Read on to find out why you should invest in or upgrade to a new cleaner EcoDesign Ready stove now. Defra published its draft Clean Air Strategy on 14th January 2019. Stove owners and those thinking of buying a new stove can be assured that the government is not seeking to ban wood burning stoves. Instead it wants to ensure that consumers use the cleanest stoves and the cleanest fuel. 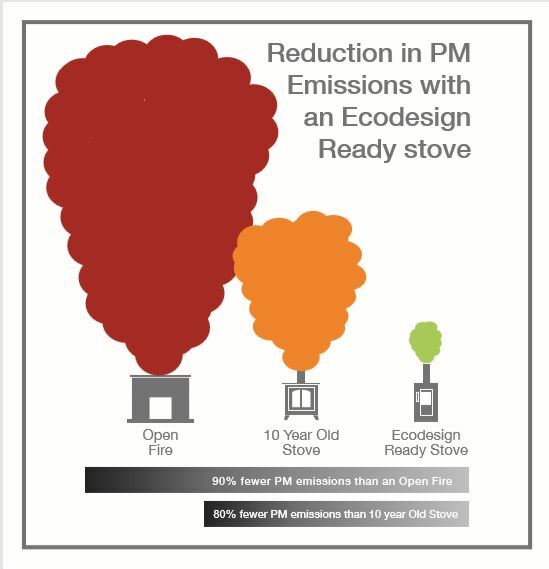 The Clean Air Strategy recognises that all wood burning is not the same and that reductions in particulate emissions, (PM), can be achieved through the installation of Ecodesign Ready stoves burning Ready to Burn logs that have a moisture content below 20%. The government has also recognised that maintenance and the way in which householder operates the stove have a significant part to play in the reduction of emissions. The test results then must be verified by HETAS. The stove will then be listed on the HETAS web site. The next model to go for new testing will be the Ekol Clarity Double-Sided (expected spring time), followed by the Ekol Inset models. Once certified you will see these listed on here as EcoDesign models. If you have any questions about EcoDesign or reducing emissions please contact us by phone or email and we will be able to assisit quickly.